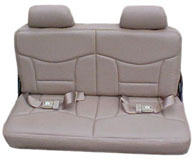 33" - Jeep, Pathfinder, Rodeo and S10 seat that accommodates 2 kids and has many coverings includes 2 seat belts and standard mount kit in these suv 3rd seats. 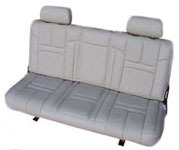 39" - 91-00 Explorer 4-runner trooper or mountaineer accommodates 2-3 kids available in all dealer materials and sew patterns in these suv 3rd seats. 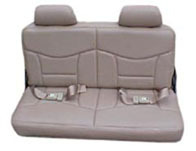 45" - 2005+ Jeep Grand Cherokee seat that accommodates 2 kids and has many coverings includes 2 seat belts and standard mount kit in these suv 3rd seats.